This is my second review of an anti-aging product by clinical skincare brand Solvaderm, after their ACE-Ferulic serum. The brand has developed a whole range of skincare solutions for the common challenges faced by aging skin, and Stemuderm focuses on lines and loss of firmness, with a formula mostly based on peptides. 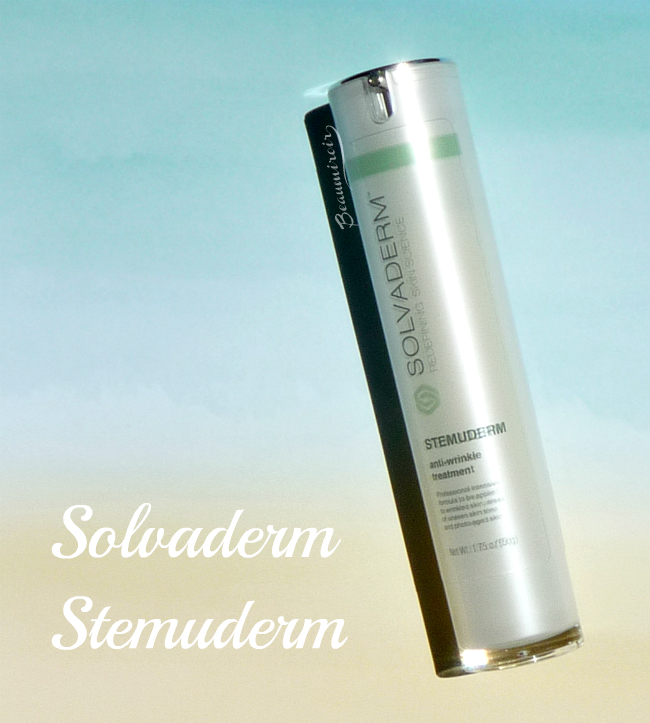 Stemuderm comes in an airless pump bottle. I've said that in a few posts before, this is the best type of packaging to protect fragile ingredients from being degraded by air and light. The thin and tall bottle is really beautiful with a pearly white sheen visible through the outer layer of clear plastic. Pretty stunning, easy to use and sanitary, but it's tall enough that it wouldn't fit in my skincare cabinet. One pump is the perfect amount for my face, and I use a second pump for the neck and decollete. The product is a cream with a light texture and no scent. It spreads on my skin easily with a lightweight sensation, and it absorbs well and fast. It leaves just a little bit of residue on the surface, but nothing heavy, and it doesn't look or feel greasy at all. In fact the finish looks and feel more satiny. After application my skin feels supple and smooth, and it works as a good base for the products that follow, whether it's moisturizer or makeup. When I first checked the ingredients list, I was a little worried that the apricot kernel oil would make me look oily, but it hasn't been the case at all. Talking about the formula, this product contains a lot of good, beneficial ingredients, but I would take the brand's claims with a grain of Himalaya pink salt. The promise that some peptides can have a Botox-like effect and the efficacy of plant stem cells are both very controversial and the lack of published, peer-reviewed studies on these subjects makes me very cautious. Nonetheless, this product is loaded with peptides, a relatively new and promising ingredient in skincare products. Peptides are chains of amino-acids (what proteins are made of) that appear to have an important role in a multitude of processes happening in our body at the cellular level, as cell-communicating agents. Besides no less than 5 of these peptide complexes, Stemuderm also contains ingredients that are known to boost hydration and protect skin: hyaluronic acid, squalane, jojoba and apricot oil. Here's the full list of ingredients as it appears on the bottle: Purified Water (Aqua), Simmondsia Chinensis (Jojoba) Seed Oil, Prunus Armeniaca (Apricot) Kernel Oil, Squalane, Hyaluronic Acid, Laureth-7, C13-14 Isoparaffin, Polyacrylamide, Acetyl Hexapeptide-8, Pentapeptide-3, Dipeptide Diaminobutyroyl Benzylamide Dicetate, Acetyl Glutamyl Heptapeptide-1, Palmitoyl Oligopeptide, Palmitoyl Tetrapeptide-7, Malus Domestica Fruit Cell Culture, Phenoxyethanol, Ethylhexylglycerin. One thing I like about Stemuderm is that although it's not heavy at all, it brings me enough moisture that I can use it by itself at night. I initially thought that it was a classic serum that must be followed by a regular moisturizer, but this summer I haven't felt the need to add anything on top of it. As far as the anti-aging properties go, it will take a while before I can objectively judge its efficacy, because improvement takes time to be noticeable. But with the quality ingredients it contains, I'm confident that Stemuderm is beneficial for my skin! Overall: Stemuderm is a well-formulated anti-aging treatment that pairs an impressive amount of peptides with moisturizing and skin-protecting ingredients. It's lightweight and pleasant to use, and it can double as a moisturizer for normal or combo skins. Where to buy? At partner dermatologists' offices or online. The product featured in this review was provided by the brand through Brandbacker for review. I received no compensation other than a free sample to write this post, which only reflects my personal opinion. This post does not contain affiliate links.